The Structural Eurocodes are a suite of ten standards for the design of buildings and civil engineering works, as illustrated in Figure 1.1 and Plate 2 (in the book's colour section). 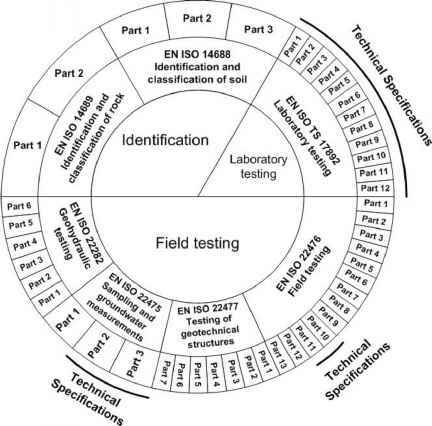 These standards are divided into fifty-eight parts and are accompanied by National Annexes issued by the various European countries that have introduced the Eurocodes into their design practice. Figure 1.1. Standards within the Structural Eurocodes programme. See Plate 2 for colour version. 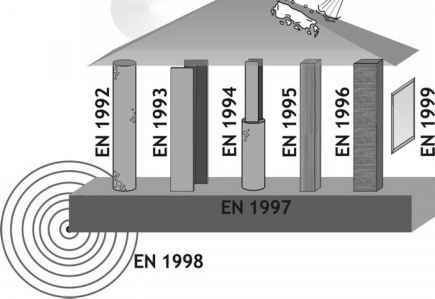 Outside and above the building in Figure 1.1 are ENs 1990 and 1991, key aspects of which are discussed in Chapter 2, Basis of structural design. The pillars of the building in Figure 1.1 are the 'resistance' codes (ENs 1992 to 1996 and 1999), each of which provides detailed rules for the design of structures built in a particular material type. Finally, supporting the building in Figure 1.1 are Eurocodes 7 and 8. Thus, there are a total of 58 parts and sub-parts that constitute the ten European standards in the EN Eurocode suite.